We spent the end of last week at the soggy beach with my family and lots of other people. Big J stayed home to "work." As you can imagine most of little J's time was spent being spoiled by Nana and Papa. He has lots of new Spider Man stuff and some Thomas the Tank Engine books. He got lots of rocking and he stayed up late every night. It's amazing how his perspective of the ocean has changed so much in the last year. He used to tremble if he got near the waves, and he hated the feel of the sand on his feet and hands. This time he was having a blast. He loved the water, and the sand wasn't a bother. The sun did come out so that he was able to play in the water, and he wanted everyone else to get in too. Here are just a few photos from our trip. 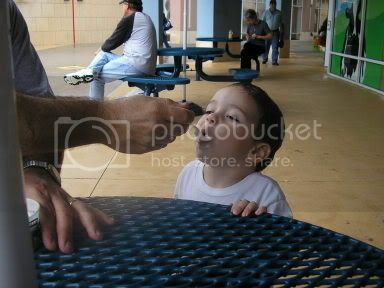 J and Papa shared some ice cream from Ben & Jerry's. 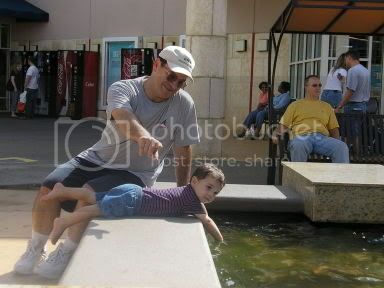 One day Papa let J play in all the water at the outlets while everyone else was shopping. He was soaked! 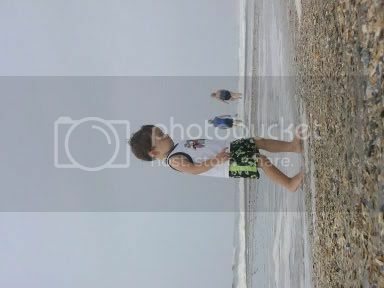 Even when it was cloudy, J loved to run around on the beach! Looks like he took after Grandma and LOVES the beach!